The free iPad app MakerBot PrintShop version 1.5 is now available in the iTunes App Store. Version 1.5 offers a new feature called Shape Maker that turns 2D images into 3D-printable files. Designed for beginners who want to get started quickly with 3D printing, Shape Maker allows users to transform sketches, photos and screen captures into files that can then be sent to a variety of MakerBot printers. 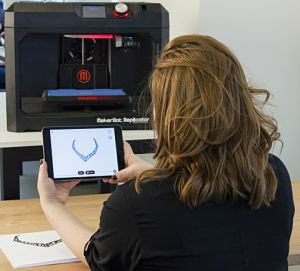 To get started with Shape Maker on MakerBot PrintShop, users open the app, select Shape Maker and use the iPad’s camera to snap a photo of a drawing or an item that has a distinct contrast and simple lines. The slider tools help select the areas of the drawing to 3D print and scale. When all of the items or lines to be printed turn green, users can choose a background and then select print or save right from the screen. Saved files are stored in the MakerBot Cloud Library and can be accessed through personal accounts on Thingiverse, the design site for viewing, sharing and 3D printing digital designs. Files can be sent via WiFi directly to a MakerBot Replicator Desktop 3D Printer, MakerBot Replicator Mini Compact 3D Printer or a MakerBot Replicator Z18 3D Printer. To see a video of Shape Maker for MakerBot PrintShop in action, click here.